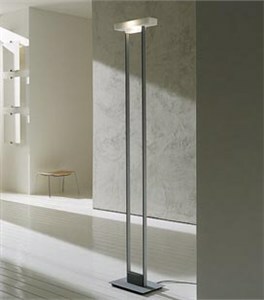 DESCRIPTION Clean-lined floor lamp providing indirect illumination from a halogen light source. 2 versions are offered. Companion wall sconces are also available. CONSTRUCTION An all-metal frame supports the diffuser at top, which is of the same metal finish, or a glass diffuser. A lower crystal glass accent piece is present on all versions. An in-line dimmer is provided on the black cord. LIGHT SOURCE 1 x 200 watts, halogen, T-3 RSC (provided). GLASS COLOR Satin White diffuser on glass version, Clear Crystal accent on all version.